This book was first recommended to me by my cousin about three years ago, and it has taken me until now to read it. I will shamelessly admit that I totally disregarded the original recommendation. “It’s about these boys”, my cousin told me, “ and they’re stuck in a maze.” It sounded awful, and I decided never to read it. I only picked it up now because I saw the movie trailer, and it made the plot sound a lot more exciting and a lot less ridiculous than I thought it would be. With that said, the premise is ridiculous, like a nonsensical nightmare. When Thomas wakes up in the glade, in the middle of a giant maze that moves at night, he cannot remember anything except his name. If you can suspend your disbelief , please do , it is worth it in the long hall. The first half of the book is slow. 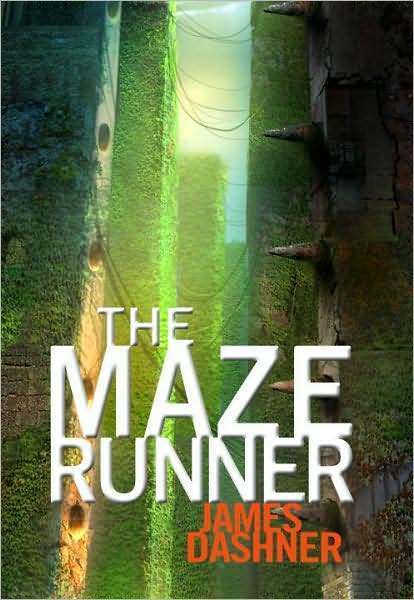 Dashner builds the world of the glade and the maze, and introduces us to a crop of new characters. Much like in Lord of the Flies, I found it very difficult to remember the names of the adolescent boys, but I’m pretty sure that this is my own fault not Dashner’s. I am really awful with names. Thomas spends the first half of the book running around feeling lost and sorry for himself, understandably, and the others spend their time making fun of him. I found this half of the book quite tedious and the pacing was very slow. I had to force myself to read it sometimes, but I was glad I persevered. The book picks up pace in the second half and becomes quite gripping. By the end of the narrative I was left reeling from the information overload dumped upon the reader in the final chapter. This novel definitely poses more questions than it answers and I feel like I’ll definitely have to read on to find out more about why the boys are in the Maze, and about Thomas and Teresa’s life before the Maze. A huge feature of the novel is the glader’s slang, which got on my nerves sometimes. I took it to be a representation the boys’ isolation, they have no contact with the outside world so they invent their own dialect. But even if this was Dashner’s intention, I found that the only thing it succeeded in doing was breaking up the dialogue and leaving me confused as to what they were trying to say. And he was using it as a way to sneak curse words into a middle grade novel, he would have been better off without them at all. The characters were a bit bland in my opinion, my favourite being Minho, but apart from that they were all just a bit boring. This book is routinely compared to The Hunger Games , but in my opinion The Maze Runner isn’t a patch on them. Maybe I have to give it more of a chance, but I’m not too optimistic about it. I am definitely still going to go see the movie, I’m looking forward to seeing how the book is translated to the big screen and I’ve heard some really good reviews. I feel like I’m a little too old for this book, and if I had read it three years ago when it was originally recommended to me I would have like it more. I would recommend it to teenagers between the ages of 12 and 17, especially to those who enjoyed books like Divergent and The Hunger Games.